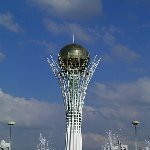 In real life the Bayterek Monument has a much better meaning to it and hides a beautiful tale about a magic bird who nestled her egg in the middle of two large branches which were part of the Tree of Life giving birth to hope and happiness for Kazakhstan. This special Bayterek Monument functions like an observation tower for the city and a touristic viewpoint at the same time. 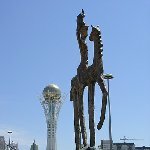 In time it also has become a modern landmark for Astana and the symbol of a new Kazakhstan. Especially at night the Bayterek Monument is a real eyecather as different light shows make it change colour and lite up the center of Astana. Looking at it with in the back of your mind this beautiful tale it makes you remember the magic bird and feel an instant feeling of happiness. But this new feel to Astana can be found all over the city as new monuments and constructions like the new Parliament Buildings, Kazakhstan Central Concert Hall and the Opera House inside the Palace of Peace and Reconciliation rise. I really loved our stay in Kazakhstan, and especially Astana made a really positive impression on me, a place I would love to return to. 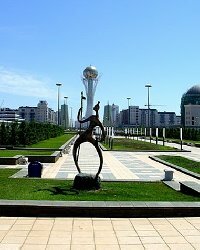 Did you enjoy Astana in the capital of Kazakhstan and have you been on a holiday in Astana, Kazakhstan? 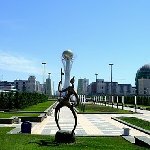 Where to stay in Astana: We stayed at the Imperia G Hotel which was nice but expensive, next time we will try to find a guesthouse. What to do in Astana: Look down over the city of Astana from teh Bayterek Tower. Where to eat in Astana: Ali Baba Restaurant near the Astana Towers near the Ishim River. Disliked: We had some trouble finding a good and economic hotel.